Set up NFS shares that will serve as a data domain on a Red Hat Enterprise Linux server. It is not necessary to create an ISO domain if one was created during the Red Hat Enterprise Virtualization Manager installation procedure. Specific system user accounts and system user groups are required by Red Hat Enterprise Virtualization so the Manager can store data in the storage domains represented by the exported directories. For more information on the required system users and groups see Appendix G, System Accounts. Attach an NFS storage domain to the data center in your Red Hat Enterprise Virtualization environment. This storage domain provides storage for virtualized guest images and ISO boot media. This procedure assumes that you have already exported shares. You must create the data domain before creating the export domain. Use the same procedure to create the export domain, selecting Export / NFS in the Domain Function / Storage Type list. In the Red Hat Enterprise Virtualization Manager Administration Portal, click the Storage resource tab. Enter the Export Path to be used for the storage domain. The export path should be in the format of 192.168.0.10:/data or domain.example.com:/data. The new NFS data domain is displayed in the Storage tab with a status of Locked until the disk is prepared. The data domain is then automatically attached to the data center. To increase the amount of NFS storage, you can either create a new storage domain and add it to an existing data center, or increase the available free space on the NFS server. For the former option, see Section 7.2.2, “Attaching NFS Storage”. The following procedure explains how to increase the available free space on the existing NFS server. Click the Storage resource tab and select an NFS storage domain. In the details pane, click the Data Center tab and click the Maintenance button to place the storage domain into maintenance mode. This unmounts the existing share and makes it possible to resize the storage domain. 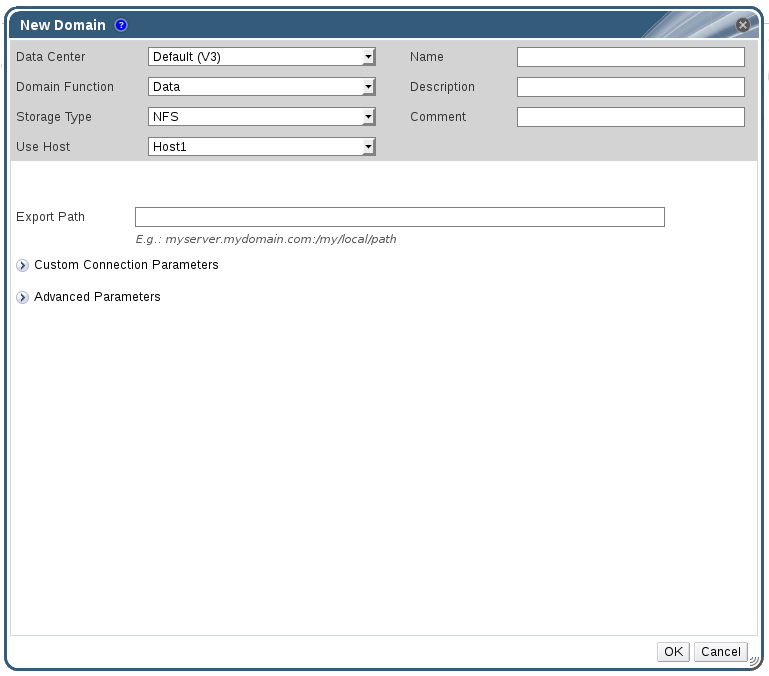 In the details pane, click the Data Center tab and click the Activate button to mount the storage domain.